Since 2000 Steve has set routes and boulder problems all over the UK and Europe. Currently professional route setting is his main occupation. With an engineering background and an eye for perfection as well as experiencing just about every conceivable move, Steve is capable of creating routes and problems that are challenging at all levels. In particular he is noted for an interesting style more closely resembling the outdoors and not simply about pulling hard on blobs! As a BMC qualified route setter Steve works all over the country, and is currently a regular at Hull Rockcity, The Castle and The Third Space in London, Derby Altar Rock, The Foundry in Sheffield, The Boardroom near Chester and Newcastle Royal Grammar. 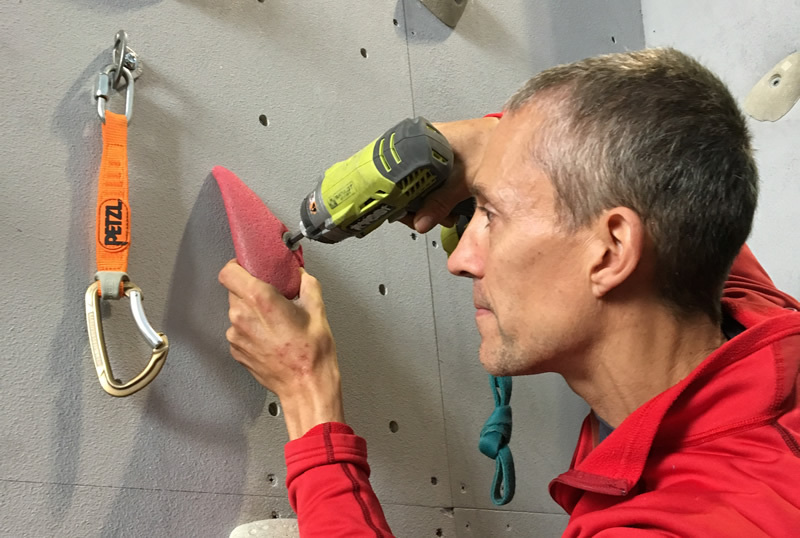 He was also chief setter for the famous Skymasters events, and works regularly with the BMC in setting for national competitions having set for the 2014, 2015, 2016 and 2017 British Lead Climbing Championships. As well as for indoor centers, Steve has also set on private home boards, creating problems and circuits to suit specific clients and their long and short term goals. Insured, and with his own equipment, contact Steve to discuss potential setting work at your facility.